Arithmetic: Add, subtract, multiply, divide and square root. Trigonometric: Sine, arc sine, cosine, arc cosine, tangent and arc tangent. Logarithmic: Common logarithm, natural logarithm, natural antilogarithm. Other functions: xy, 1/x,, data storage and positioning keys. Easy-to-read LED display gives answers with accuracy of up to 10 significant digits. Decimal point is automatically positioned. Numbers smaller than 10-2 and larger than 1010 are displayed in scientific notation, with the exponent of 10 (phis or minus) shown at the extreme right. Pre-programmed functions let you perform log, trig and exponential calculations 10 times faster than with a slide rule. Operates on battery or AC-line power. The HP-35 comes with a rechargeable nickel-cadmium battery pack which provides enough power for three to five hours of continuous operation. Impending battery depletion is indicated by the lighting of all decimal points in the display. AC-line operation (115 or 230 volts) and simultaneous battery charging are accomplished by simply plugging in the battery charger supplied with the HP-35. Compact, rugged case fits easily into shirt pocket or briefcase. Four-register, operational memory-stack automatically Stores and retrieves intermediate solutions during complex calculations, eliminates need for scratch notes and re-entry of data. Data manipulation keys allow contents of any register to be displayed for review. A separate, addressable memory register is also provided for storage and retrieval of constants. Click here to play around with this calculator. 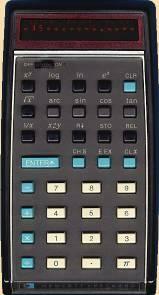 The HP-35 was introduced by Hewlett-Packard in 1972. 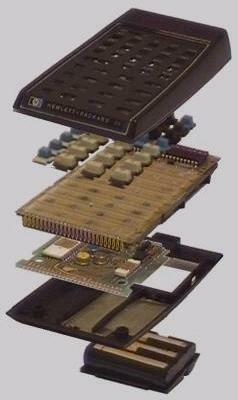 Manufacture of the HP-35 ceased in 1975. Come 2007, HP 35 will be 35 years old. HP 35 was invented 35 years ago. Tagged By: HP Calculators pays homage to legendary HP-35, HP Calculator Heritage Ads 1972, HP Labs honor HP 35, HP 65 programmable pocket calculator, What’s pocket-sized, does ..., Victor Mayer Amedee Mannheim.